A fair description of pinto beans could begin with labels such as nutrient-rich, low-fat and an excellent source of protein and fiber. While these terms accurately imply that pinto beans are healthy, the details about their nutrients seal the deal. One cup of pinto beans provides more than 20 percent of the recommended dietary allowance of six vitamins and minerals, as long as you fix them from scratch rather than choosing the canned variety. If you eat a 3-ounce serving of fish, meat or poultry, or a cup of soybeans, you'll get 20 to 25 grams of protein, according to the Institute of Medicine. While these foods represent those with the highest amount of protein, pinto beans aren't far behind. You'll get 15 grams of lean protein from 1 cup of boiled pinto beans. This serving provides 33 percent of women's and 27 percent of men's recommended dietary allowance, or RDA, of protein. A 1-cup serving of boiled pinto beans contains 245 calories and just 1 gram of fat. One cup of boiled pinto beans provides 15 grams of fiber, or 60 percent of your daily value based on a 2,000-calorie-a-day diet. If you add pinto beans to your diet gradually and eat them regularly, your body has time to adjust, and you can avoid gaseous side effects, according to FamilyDoctor.org. When participants in a research study ate 1/2 cup of pinto beans, baked beans or black-eyed peas daily, 70 percent of those who experienced flatulence in the first week reported it was gone after eating beans regularly for several weeks, according to the November 2011 issue of the "Nutrition Journal." Regulations established by the U.S. Food and Drug Administration define a rich, or excellent, source of nutrients as any food that contains at least 20 percent of the RDA for the nutrient in one serving. 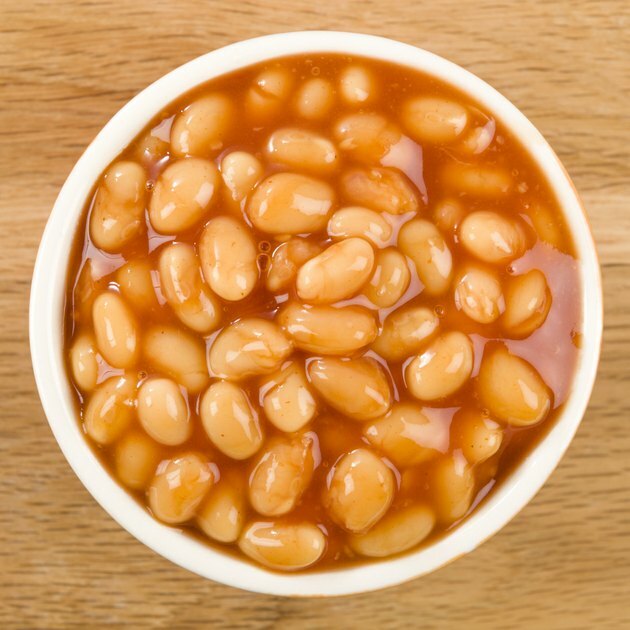 If you consume 1 cup of boiled pinto beans, they're an excellent source of iron, magnesium, manganese, thiamin and vitamin B-6. They're exceptionally high in folate, too. One cup of boiled pinto beans supplies 294 micrograms of folate, which is 74 percent of the RDA of 400 micrograms. The same portion also provides at least 10 percent of your daily value for potassium and selenium, based on a 2,000-calorie-a-day diet. The canning process depletes some nutrients. Canned pinto beans retain less iron, magnesium and potassium. They also have four times less thiamin and riboflavin than boiled pinto beans. Canned pinto beans have seven times less folate than boiled beans, according to the U.S. Department of Agriculture. On the other hand, canned beans contain significantly more sodium. Pinto beans that are boiled without adding salt to the water only have 2 milligrams of sodium in a 1-cup serving, compared to canned pinto beans with 409 milligrams. You can reduce the sodium by purchasing low-sodium brands or by draining canned beans and then rinsing them under water.